Saturday morning 23 November, I left Sydney at 6 am and was afforded light traffic leaving Sydney. This permitted me to reach Hornsby rather quickly. 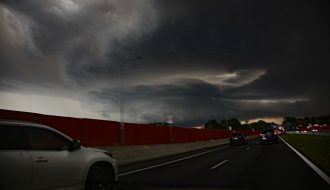 I headed up the F3 freeway and I was stunned to be chasing an early storm by 7.30 am approaching Cessnock. I reached Cessnock a little after 8 am where I reached the southern edges of that storm cell. By now it had become a large complex, was high based but only producing anvil crawlers. I proceeded to the southern side of town where I photographed new updraft towers rising on the southern side of that cell. These eventually weakened and I let the whole storm complex go. That gave me time for breakfast. After 10 am following some sunshine, I was stunned to see strong cumulus cloud towers to the south west and noticed a storm cell building rapidly. 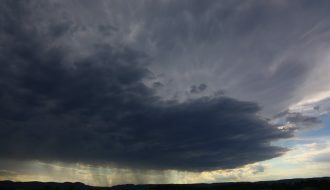 I drove to the southern side of town where I saw two thunderstorm cells maturing with one to the south and another to the west south west. The storm to the south west was intriguing with a dark cloud base that was broadening and becoming larger and larger. 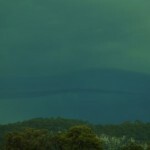 As it approached, it exhibited a green tinge and began to produce a few strong cloud to ground lightning strikes including a couple into clear air ahead of the storm. I knew that this had to be a strong storm, unusually strong for this time of day (10.30 am). The base of the storm was stunning for the time of day. Realizing its strength, I relocated my car under the porch of a nearby soccer ground change room which was just large enough to fit it. The base exhibited stunning shapes and colours and some big lightning strikes. 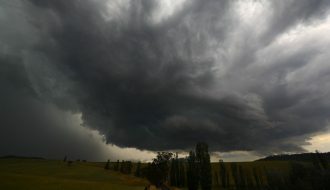 The core passsed right over me 3 km south of Cessnock bringing very significant gales, a near whiteout, such heavy rain and much hail. I was too busy taking photos to worry about its size so I do not know how big they were. The rain and hail was blowing near horizontal which made it very difficult to take photos. 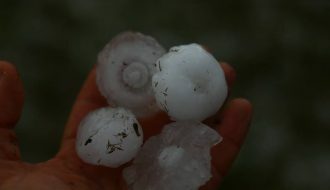 As I moved around the shelter, I was hit on the head and back by blowing hail which stung my back. The rain was such intensity that water was soon overflowing the parklands and fields. The storm lasted roughly 10 minutes before easing as it passed east and it was over. I was dumbfounded of what I had experienced and I was left wondering why was this storm so strong for this time of day. It was all over by 11 am. This would have caused some chaos in the locality. I have since checked the BOM rainfall figures and noted that Cessnock Airport had 8 mm and a peak wind gust of 33 km/h. The storm appears to have skirted the airport. The nearest rain guage to me was nearby Pokolbin (18 mm). The core passed between the two rain guages and unfortunately it did not pass over a weather station that I could find to determine the strength of the wind or the amount of rain that fell. Following that storm, I was in contact with Colin who had reached Singleton and alerted me to another significant storm near to where he was. I could see it in the distance and I decided to try and intercept it. 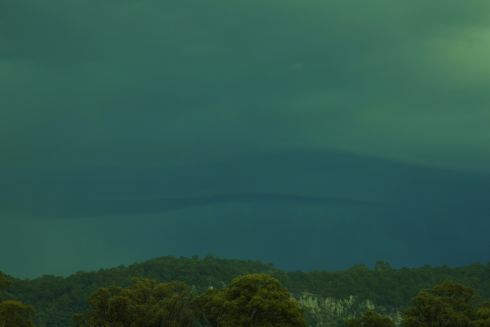 West of Cessnock, I could see its base and made ground closing in on it. I reached it but it had lost much of its structure including any hail that it may have had. It was too far away from me to reach it in time to get the structure (At least 50 km). 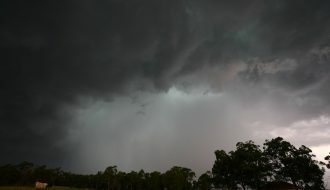 It passed over me producing some heavy rain including one very close cloud to ground lightning strike. I then made contact with Colin and we decided to meet up at the railway bridge at Singleton. 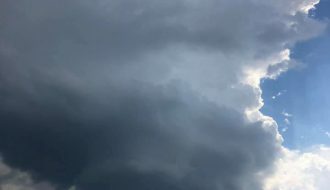 He confirmed with me that he did get the cloud structure of that storm which I could not get. I met Colin and we waited it out while another storm cell passed over us. We were watching radar quite alot monitoring the storms going on in Sydney. The storm to pass over us produced moderate rain and some moderate thunderclaps. There were stronger cells to the north but these were highly embedded and we decided not to chase due to poor structure. The problem was, too many storms had developed and were merging with one another. 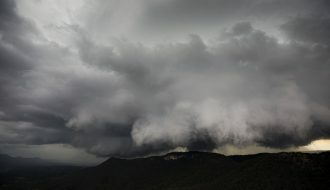 Note:- The photo here shows some of the cloud base as it rapidly approached me from the west / west south west. Note:- The photo is the base of the storm. This portion passed to my north. 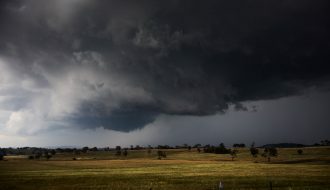 With a clearing trend and sunshine again, Colin and I waited for 2 hours and watched new low topped storm towers develop to the south in national park and bushland. We took photos but with so much low cloud building on the hills, it was pointless trying to chase them. These soon collapsed and we both elected to end the chase around 5 pm. By now activity was waning with no further storm activity. The final photo in this series and heading is the core passing over me. 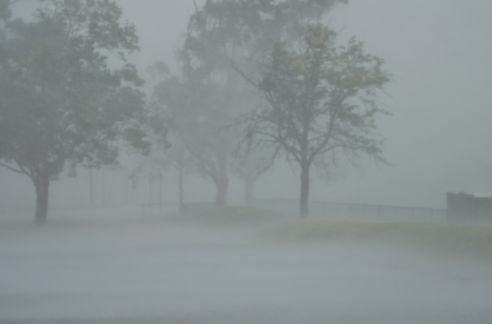 There was no way I was going to attempt to film this as the wind, hail and rain was too strong and rain and hail blowing everywhere. I would have had water damage to my camera. However, I was using my DSLR camera which is much smaller. While protected, I was able to get this shot of the core showing what it was like. I have never experienced this type of activity so early in the day (10.40 am to before 11 am). I was stunned. This was a significant but relatively small storm to impact south Cessnock and surounding areas. I suspect, it would have weakened as it went further east to cross the coast.